This Dr. Who themed wedding was out of this world! 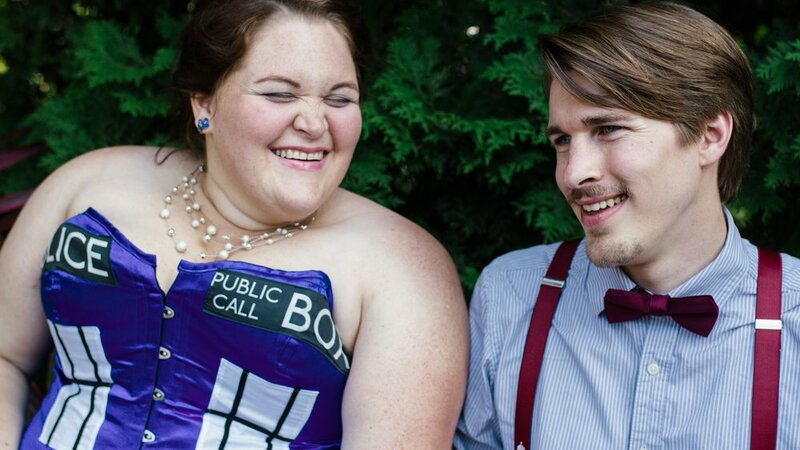 Kim + Jason have a love of all things Dr. Who, and their wedding was not only a tribute to their their love for each other, and their family and friends, but also their shared love of the Doctor! Jason was dressed as the 11th Doctor (sonic screwdriver, and all) and Kim had on a gorgeous custom-made Tardis dress. The best man was dressed as the 10th doctor, and the bridesmaids were dressed in matching Dr. Who dresses, and a number of guests also dressed the part as well! Kim + Jason's ceremony was short, and sweet, and officiated by Kim's brother. It ended with a symbolic hand-tying ceremony, which the couple opted for instead of a ring exchange. After the ceremony, Kim + Jason greeted their guests and then we spent some time walking around the Olbrich Botanical Gardens taking photos of the two of them practicing their first dance (with the best man there providing dancing tips). From there, we headed over to the Goodman Community center for a fun, laid-back reception, featuring a ton of adorable dancing children, including the couple's two kiddos, and, you guessed it, a Dr. Who-themed cake! Kim + Jason's wedding day was an awesome celebration of the commitment of thees two super neat people, and we couldn't be happier we got to celebrate with them! p.s. If you want to check out their awesome engagement photos, click here! Here are the vendors (with links) that made this wedding day awesome! Daniel + Seth had one of the most fun, intimate, and creative weddings we've ever had the good fortune to photograph! I mean, who doesn't want to be involved in a Clue-themed wedding, complete with candlesticks, lead pipes, and toy guns for props?! The ceremony held in Olbrich Conservatory in Madison, WI, and the reception at Louisianne's in Middleton, WI. The amazing cake (seriously, wait until you see it!) was made by Gigi's and make sure to scroll all the way to the end to see the surprise this cake (and these two awesome grooms) had in store for these wedding guests!